Canadian multi-percussionist François Taillefer is passionate percussion that explores worldwide and ages for over twenty-five years. His interest in contemporary music, folk and experimental, was shaped through his many travels and music sharing. He attended several courses of percussion in various countries including France, Spain, Peru, as well as Tunisia and the United States. Sustained during his career in his artistic endeavors by the Council of Arts and Letters of Quebec and the Canada Council for the Arts, François graduated in 2010, the French Government, the card Skills and Talents. This long-stay visa allowed him to move to Lille where he develops projects in the arts and culture of the region, while seeking to build bridges between France and Canada. François Taillefer is a curious and adventurous musician who is always looking to expand its horizons in search of new ideas. For over twenty years, François Taillefer has-been passionate for music and percussion from around the world and different eras. His interest for Modern, World, Folk and Experimental music Was Discovered through His Numerous trips and musical experiences. 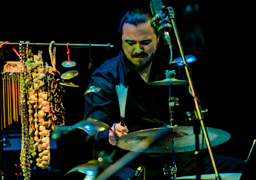 He Has Attended various percussion workshops in different countries Such As Spain, France, Peru, Tunisia, Niger and the US. Multiple holder grant from the CALQ and the CCA, François HAS Obtained in 2010 the "Competence & Talent" card from the French government. He now lives in Lille, Creating new artistical projects and collaborations, aussi Attempting to build bridges entre France and Canada. François is a curious and open minded musician Who never hesitates to explore intriguing ideas and new frontiers.